Protologue: Sp. pl. 1: 349 (1753). Mimusops elengi is native to India, Sri Lanka, the Andaman Islands, Myanmar and Indo-China, but is commonly planted as an ornamental tree throughout the tropics, also in Africa, where it has been recorded from e.g. Ghana, Tanzania, Mozambique, Réunion and Mauritius. It has become naturalized locally in Réunion. In Asia the heavy, strong and durable wood of Mimusops elengi is well known as suitable for heavy general construction, bridge building, boat and shipbuilding, marine construction, flooring, bearings, doors and framing. It has also been used for poles and piles, foundation sills, railway sleepers, paving blocks, mine timber, furniture and cabinet work, vehicle bodies and wheels, turnery, tool handles, walking sticks, weaving shuttles, toys, sporting goods and musical instruments. In Africa the wood is considered good for mortars. A good-quality veneer and plywood can be manufactured from the wood. Mimusops elengi also yields a good fuelwood. Mimusops elengi has fragrant flowers and is often planted as an ornamental and shade tree in gardens and along roads, also in coastal sites. In Asia the leaves are used medicinally to treat headache, toothache, wounds and sore eyes, and are smoked to cure infections of the nose and mouth. A decoction of the bark, sometimes mixed with the flowers, has been used against fever, diarrhoea, inflammation of the gums, toothache, gonorrhoea, wounds and, mixed with tamarind bark, as a lotion for skin complaints. The flowers have been used against diarrhoea. The young fruits have been employed in a gargle for treating sprue. The pounded seeds are used to cure obstinate constipation. Fresh flowers yield an oil used as perfume and are also strung in garlands or necklaces for decoration, or placed in linen-cupboards. The seeds are also used for necklaces and yield an oil on pressing, which has been used for cooking and illumination. The starchy fruits are edible, but reported as tasteless and/or astringent. According to other sources, they taste like dates but are more dry. In India the bark has been used for tanning, but the tannin content is low. In Ghana the bark is used for toughening and colouring tackle. In some countries in tropical Asia (e.g. Indonesia) Mimusops elengi wood is a commercial wood, but it is probably traded in mixed consignments comprising the wood of many other Sapotaceae. In Africa it is used only very locally and not traded. 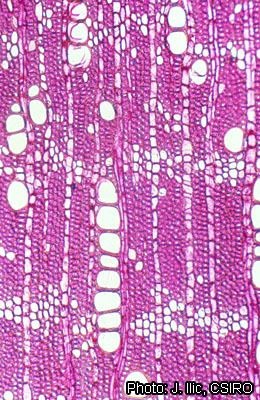 The heartwood is deep red or dark red-brown, often with darker streaks, not sharply demarcated from the paler 5–7 cm wide sapwood. The grain is straight, wavy or slightly interlocked, texture very fine to fine and even; occasionally with watered-silk figure on the tangential face of sapwood. The taste is bitter and the wood contains saponin and lathers when rubbed with water. Mimusops elengi yields a heavy hardwood. The density is 780–1120 kg/m³ at 15% moisture content. The rates of shrinkage are moderate to very high, from green to 12% moisture content 3.2% radial and 5.1% tangential, and from green to oven dry 4.7% radial and 11.4% tangential. It takes about 2 months to air dry boards 3 cm thick from 40% to 15% moisture content. The wood is liable to end-splitting, warping and surface checking if not carefully seasoned. In a test in Indonesia, the wood of Mimusops elengi showed the following mechanical properties at 15% moisture content: modulus of rupture 139 N/mm², modulus of elasticity 15,190 N/mm², compression parallel to grain 65.5 N/mm², shear 7.5–9.5 N/mm², cleavage 105 N/mm radial and 110.5 N/mm tangential, Janka side hardness 9430 N and Janka end hardness 10,270 N.
The wood is very hard, very strong and tough, and is generally considered difficult to work, especially in sawing, due to the presence of silica, but is easier to work when still green; stellite-tipped saws are recommended. It finishes very well using sharp tools. The wood is very durable, even when exposed to the weather or in contact with the ground. It is reportedly resistant to marine borer attack and to dry-wood termites. The sapwood is susceptible to Lyctus. The heartwood is very resistant to impregnation with preservatives. The energy value of the heartwood is 21,340 kJ/kg, that of the sapwood 21,090 kJ/kg. The seed kernel contains about 22% oil. The fatty acid composition of the refined oil is: oleic acid 64%, linoleic acid 14.5%, palmitic acid 11%, stearic acid 10% and behenic acid 0.5%. The nutritional quality of the refined oil was comparable with that of groundnut oil in feeding tests with rats. Several triterpenes (e.g. β-amyrin, lupeol, α-taraxerol and ursolic acid) have been isolated from Mimusops elengi, as well as steroidal glycosides. The major chemical compounds in the flowers are aromatic alcohols and esters derived from the phenylpropanoid metabolism. The ethyl-acetate-soluble fraction of an alcoholic extract of Mimusops elengi bark showed anti-ulcer activity against experimental gastric ulcers; this activity was attributed to a decrease in gastric acid secretory activity along with strengthening of mucosal defensive mechanisms. A methanolic extract caused hypotensive activity in anaesthetized rats; it may possess calcium-blocking activity. The saponins from the seeds are effective against Phytophthora palmivora and Colletotrichum capsici, and field trials in India showed that they can be used for control of these pathogens in betel pepper (Piper betle L.) plantations. The wood of several Mimusops species indigenous in Africa probably has similar properties and possible applications. Evergreen, small to medium-sized tree up to 30(–40) m tall; bole up to 100 cm in diameter, often short and divided into several large main branches but sometimes branchless for up to 15(–20) m, buttresses absent or up to 2 m high; bark surface becoming deeply fissured and sometimes peeling off in thin scales, grey, brown or dark red to blackish, inner bark fibrous, pink or reddish, with scanty watery or white sticky latex; crown dense, rounded and spreading, glossy dark green. Leaves arranged spirally, more or less in tufts at the ends of branches, simple; stipules minute and caducous; petiole 1–3.5 cm long, grooved above; blade ovate to elliptical or oblong-elliptical, 4.5–17 cm × 2–7 cm, rounded at base, acuminate at apex, margins often wavy and upcurled, glabrous, with 10–20 pairs of lateral veins. $Flowers in fascicles of up to 6 in the leaf axils, bisexual or functionally unisexual, regular, fragrant; pedicel 1–1.5 cm long; sepals in 2 whorls of 4; corolla white, with a short tube and 8 lobes each deeply divided into 3, c. 1 cm long; stamens 8, alternating with 8 staminodes; ovary superior, (6–)8-celled. $Fruit an ovoid to ellipsoid berry 2–3 cm long, orange-red when ripe, 1–2-seeded. 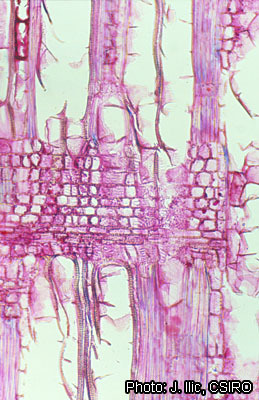 Seeds up to 2 cm long, laterally compressed, with small circular basal scar. Seedling with epigeal germination; cotyledons leafy; hypocotyl elongated. Mimusops comprises about 40 species, 20 of which occur in mainland Africa, 15 in Madagascar, 5 in the Seychelles and Mascarene islands, and 1 (Mimusops elengi) in Asia and the Pacific. It is related to Manilkara, which differs in the number of sepals, corolla lobes and stamens (6) and its elongate seed scar. Vessels: 5: wood diffuse-porous; 10: vessels in radial multiples of 4 or more common; 13: simple perforation plates; 22: intervessel pits alternate; (23: shape of alternate pits polygonal); 25: intervessel pits small (4–7 μm); (26: intervessel pits medium (7–10 μm)); 30: vessel-ray pits with distinct borders; similar to intervessel pits in size and shape throughout the ray cell; 31: vessel-ray pits with much reduced borders to apparently simple: pits rounded or angular; 32: vessel-ray pits with much reduced borders to apparently simple: pits horizontal (scalariform, gash-like) to vertical (palisade); 33: vessel-ray pits of two distinct sizes or types in the same ray cell; 42: mean tangential diameter of vessel lumina 100–200 μm; 47: 5–20 vessels per square millimetre; 48: 20–40 vessels per square millimetre; 56: tyloses common. Tracheids and fibres: (60: vascular/vasicentric tracheids present); 61: fibres with simple to minutely bordered pits; 66: non-septate fibres present; (69: fibres thin- to thick-walled); 70: fibres very thick-walled. 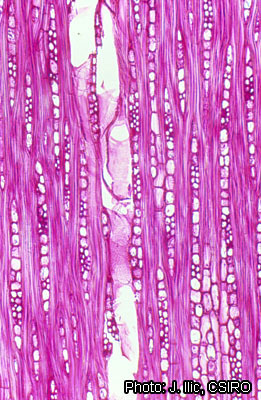 Axial parenchyma: (76: axial parenchyma diffuse); 77: axial parenchyma diffuse-in-aggregates; 86: axial parenchyma in narrow bands or lines up to three cells wide; 87: axial parenchyma reticulate; (92: four (3–4) cells per parenchyma strand); 93: eight (5–8) cells per parenchyma strand. Rays: 97: ray width 1–3 cells; 100: rays with multiseriate portion(s) as wide as uniseriate portions; 107: body ray cells procumbent with mostly 2–4 rows of upright and/or square marginal cells; 108: body ray cells procumbent with over 4 rows of upright and/or square marginal cells; (109: rays with procumbent, square and upright cells mixed throughout the ray); 115: 4–12 rays per mm; (116: ≥ 12 rays per mm). Mineral inclusions: (136: prismatic crystals present); (141: prismatic crystals in non-chambered axial parenchyma cells); 159: silica bodies present; 160: silica bodies in ray cells; 161: silica bodies in axial parenchyma cells. Seedlings and trees grow slowly, but occasionally trees may reach a height of 34 m in 20 years with a bole diameter of 50 cm, i.e. a mean annual diameter increment of 2.5 cm. Trees may flower and fruit throughout the year. Infrequent visits of insects and bats have been observed, but pollination is most likely by wind. The stigma is receptive before the pollen is released, stimulating cross-pollination. The seed is known to be dispersed by bats, but monkeys, squirrels and wild pigs probably also eat the fruits. In its natural area of distribution in Asia Mimusops elengi is fairly common near the sea, but may also be found in rocky locations and inland forest, up to 600 m altitude. It thrives in areas with perhumid or slightly seasonal rainfall types, but is usually found in seasonally dry habitats. It can stand waterlogging for up to 2 months. It requires fertile soil. It is tolerant of light frost. Mimusops elengi can be propagated by seed or cuttings. Seed can be stored for about 9 months and needs ‘after-ripening’ during the first month of storage. There are about 2000 dry seeds/kg. Seed germinates in 17–82 days and the germination rate is 70–90%. It is best sown directly in containers. Seedlings can be planted out when 20–30 cm tall. The rooting success of 10–15 cm long cuttings with a diameter of 0.5–1 cm is 70–90%. Mimusops elengi is shade-tolerant; it retains a full crown and reproduces satisfactorily under fairly dense shade. In Myanmar and Sri Lanka plantations of Mimusops elengi have been established. In India a foliar disease of Mimusops elengi is caused by Colletotrichum gloeosporioides. A mortality of about 20% of one-month-old seedlings was recorded by a collar rot disease, caused by Cylindrocladium spp. The sawdust is irritating to nose and throat. Trees may differ markedly in size depending on their origin, which offers potential for selection and possibly breeding activities. In some regions in Asia (e.g. the Philippines), Mimusops elengi is classified as a vanishing timber tree. Because of its superior wood quality, it is worthwhile starting silvicultural trials with Mimusops elengi, which is hitherto known in Africa mainly as an ornamental and shade tree. Lemmens, R.H.M.J., 2005. Mimusops elengi L. In: Louppe, D., Oteng-Amoako, A.A. & Brink, M. (Editors). PROTA (Plant Resources of Tropical Africa / Ressources végétales de l’Afrique tropicale), Wageningen, Netherlands. Accessed 10 April 2019. This page was last modified on 22 December 2015, at 16:41.